The national news programs that morning reported that Miami had “dodged a bullet.” That was just the first unsettling parallel to Hurricane Katrina. The national media were in downtown Miami, well away from where Andrew came ashore. They would not simply say: “We don’t know what happened yet.” That practice continues today. It was pervasive and haunting throughout the 2005 hurricane season and again during Hurricanes Ike and Irene. Hurricanes destroy communications infrastructures. It’s best to wait before declaring that bullets were dodged. 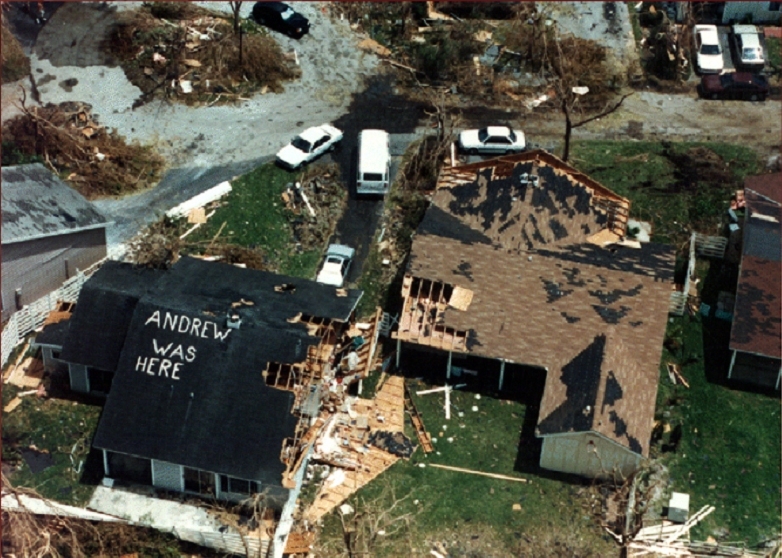 The “hurricane zone,” as it came to be called, extended from Homestead and Florida City in the south up to SW 120th Street in the Kendall section of South Dade County. If you were not there to see it, you cannot imagine the dimensions of what happened. The destruction did not just extend as far as you could see, but as far as you could see from a helicopter! Pingback: The national news reports, Miami “Dodged a Bullet.” | Dr. Iván Canino, Jr.